About 2 weeks after the Mossdale incident David Brook, Alan Brook and Dave Weston went to Mossdale Scar with tape, compass, clino and notepad. We knew the Bearing and the distance from the entrance to Rough Chamber. We surveyed the line with Dave Brook on tape and notepad, Alan on compass and clino and Dave Weston on line spotter duty and clino correction surveyor. On arriving at the Rough Chamber position we were spot on for the stake marking the induction phone link to Rough Chamber down below. We now knew the bearing and distance to the point in the cave where the bodies were found. 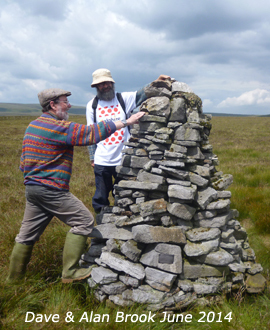 We surveyed to the correct position a little before Priests Tarn on a flat area of moor. A stake was placed at the spot and some rocks from Priests Tarn brought to pile around the stake. The game keeper for this area was Joe Cussins who had allowed ULSA to use How Gill Nick hut as a base for Mossdale trips. Over the next six months I spent many weekends ferrying rocks from Priests Tarn to the stake using a heavy duty canvas rucksack. I would build up the cairn but other cavers reported seeking Mr Mallinson, the Mossdale gamekeeper, attempting to knock down the cairn. When the cairn had been rebuilt to its present height a group of ULSA cavers including Dave Brook, Alan Brook and Dave Weston took some limestone rocks with good fossils in them from Mossdale Scar to top out the Mossdale Memorial Cairn. After a few years I made a small brass plaque and screwed it to a squarish block on the cairn. At first the cairn sank into the peat but stabilised after a few years.